Beidh Seachtain na Gaeilge ar siúl an tseachtain seo chugainn anseo in RMDS. Beidh imeachtaí éagsúla ar siúl. Beidh na páistí ag foghlaim amhráin agus dánta agus ag imirt cluichí sna ranganna. Sé “Trasna na dTonnta”, an t-amhrán a mbeidh an scoil go léir ag canadh. Tá leabhair ghaeilge ar fáil sa leabharlann agus beidh na ranganna uilig ag baint usáid astu i rith na seachtaine. Tá sé ar intinn ag ranganna éagsula léitheoireacht bheirte a éagrú. Beidh Tráth na gCeist ar siúl ar an gCéadaoin, 18ú Márta, idir rang 5 agus rang 6. Beidh Céilí mor ar súil ar an Deardaoin agus críochnóidh an féíle le tionól ar an Aoine. Ba bhaith linn dá ngleasadh na paistí in éadaí glasa an lá sin. Tá muid ag seoladh bileog abhaile ar an Aoine (amárach) le frasaí usaideacha. Bainigí triail astu chun spreagadh a thabhairt do na páistí. Tá súil againn go mbainfidh na leanaí spraoi agus sult as na himeachtaí go léir. Seachtain na Gaeilge will be happening here in RMDS next week. Various activities are being organized.The children will be learning songs, poems and playing games in the classroom. “Trasna na dTonnta is the school song for the week. There are lots of Irish books available in the library. Some classes will be organizing paired reading. The quiz will be held on Wednesday between rang 5 and rang 6. The Céilí Mór will happen on Thursday and all are welcome to dress in green! The celebrations will finish with an assembly at 11 o’clock in the hall on Friday. We are sending home a sheet tomorrow with useful phrases in Irish that you can use to encourage the children. We hope all the children really enjoy the week!! Can I remind everyone to park legally around the school in the morning and afternoon. Please do not park near the lollipop crossing and do not drive around the back of the school. Over the last number of years the school has significantly expanded the usage of IT in support of teaching and learning. This has been enabled by a remarkable investment of time and money by the school community in hardware, broadband and networking technologies. Many of you will be aware of the work of Paul Fairbrother, currently the 6th class teacher, in this area but he would be the first to acknowledge the fantastic assistance he has received from a number of parents who have generously given of their time and expertise. As a result we now have an IT infrastructure which enables students and pupils to take advantage of the expanding range of online educational resources. Parental voluntary contributions, fundraising and gifts of both hardware and services also play an important part in these developments. And these efforts are ongoing - in the last couple of weeks we were able to replace defunct projectors with interactive whiteboards in junior and senior infants. Early in the next term the school will invite interested parents to attend a morning meeting to hear more about how we are using IT in the school to benefit our children's learning. And finally on IT, for those of you who might be interested, above is a heat-map of wifi activity at RMDS one recent morning. 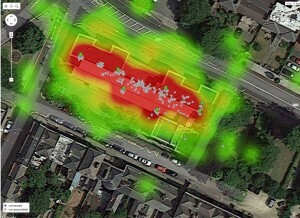 The red dots are the wifi access points, the grey are devices (smartphones, computers) which have wifi on but are not connected to the network, blue dots indicate a device connected to the network. The area shaded red indicates that we have a lot of wifi enabled devices within the school throughout the day while the green shaded area indicates the wifi signals detected from people passing by the school. The annual school accounts of 2013/14 have just been completed and are available to view in the office. I'd like to especially thank our treasurer Geraldine Hall for her work in this regard. One of the key jobs of the Board of Management is drafting school policies on a range of issues including educational, health and safety and employment matters. Such policies, once drafted and approved by the Board, can be viewed on the school website. Finally we look forward to welcoming Louise Ormiston back from her maternity leave after the Easter holidays. We thank Amal Perrera who has taken the class so far this year. We would also like to congratulate Jilly Swain (Rang 3) on her pregnancy. Jilly will be going on maternity leave in May and Amal will join Caroline O Dowd as job sharing partner to cover Jilly’s absence until the summer holidays. There is a Free electrical recycling day on Saturday 14th March in Terenure (in the car park) from 10am to4pm. Any household item with a plug or a battery, from TVs to toasters can be recycled.